Americans now obtain one-third of their calories from restaurants and take-out meals. And, it's been shown that we consume more calories when dining out (Bowman SA, et al. 2004). So, it's important to know how to make smart choices when eating at restaurants. We'll discuss that in this review. The topic of what to eat for optimum athletic performance is covered in greater detail in other Articles. Keep in mind that alcohol contains 7 kcal/g compared to other dietary carbohydrates which contain only 4 kcal/g. And even though alcohol is a carbohydrate, drinking a lot of alcohol before a race does NOT qualify as "carbo loading". Alcohol is a diuretic; you do not want to be dehydrated just before a long race or athletic event. Also, some evidence shows that alcohol can impair performance for up to 14 hours after ingestion (Yesavage JA, et al. 1986). WATCH OUT FOR CALORIE BOMBS AT RESTAURANTS! But those are just averages. Some menu choices contain way more calories than that. 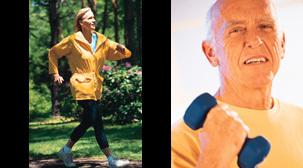 We launched our innovative and award-winning "Exercise Calorie Converter" mobile app in 2010. Before that, we offered a version that ran on PDA's (remember those?!!). And we created the web-based tool in 2006. Appetizers That Contain More Than 1800 Calories! Salads That Contain More Than 1200 Calories! Entrees That Contain More Than 2000 Calories! It's not hard to find dinner entrees that exceed 2000 calories. Note that 2000 calories is the number of calories that are typically recommended for an entire day for the average adult! Desserts That Contain More Than 1500 Calories! How many calories does your restaurant meal add up to when you include one of these desserts? Like salads, desserts span a wide range of calories. When at Maggiano's, avoid the Chocolate Zuccoto Cake. Instead, their vanilla bean ice cream is only 390 calories. A meal like this could easily exceed 3000 calories, and might even approach 4000 calories! Drink a large glass of water before starting the meal. Doing this will give you the sense of being full. As a result, you'll eat less! If the menu provides nutritional details for each item, pay special attention to the amount of fat it contains...this is often where the majority of calories come from. Be careful what you include in your salad. Creamy salad dressings such as bleu cheese, Caesar, ranch, and Thousand Island almost always have more calories than vinaigrette dressings. This is because they contain more fat. Opt for oil and vinegar, served in separate bottles so that you can control the amount. Only a few drops of each will give you the flavoring needed. Carry a food reference when you dine out. If the menu doesn't provide any nutritional details, don't try to estimate the calorie ranking of a menu item just by its name. When researchers asked people to guess the number of calories in sample restaurant meals, the responses underestimated the actual amount by as much as 600 calories. So, to avoid menu "surprises" when dining out, carry a food reference with you. Two good ones are: Bob Greene’s Guide To Fast Food & Family Restaurants and Eating On The Run by Evelyn Tribole, MS, RD (see below). An option for those who use smart-phone apps is to purchase our Exercise Calorie Converter mobile app. Version 3.3 (released February 2018) contains more than 6000 menu items from more than 50 restaurants. In addition to providing the calorie values and amount of fat, you can convert those calorie values into minutes of exercise! For many menu items, the bulk of the calories is related to how it is prepared. Frying adds an enormous number of calories to some foods. A piece of fish contains about 200-300 calories, and an average potato only contains about 250 calories. However, "Fish 'n Chips" from some chain restaurants contains 2000 calories. 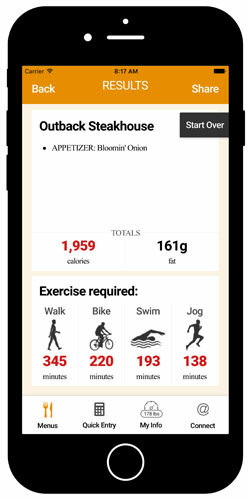 A typical softball-sized raw onion only contains about 50 calories, but Outback Steakhouse's "Bloomin' Onion" contains 1959 calories (see screen shot of our Exercise Calorie Converter app to the right). And that's an appetizer! Yes, most appetizers are meant to be shared, but, as the examples in the table above reveal, appetizers can often contain more calories than the main entrees. It's common to share appetizers and desserts....so why not entrees? Even if a restaurant charges a sharing fee (how dumb is that?!! ), be willing to pay it to get the portion size you want to avoid overeating. ...But don't match what others at your table are eating. It's well-documented that when friends dine out together, sometimes a feeding frenzy occurs (de Castro JM, et al. 1989). Just because others at your table are raving about this or that appetizer doesn't mean you need to match them bite for bite! Resist peer pressure! Build a meal from side items. Stop and think for a second: do you really need an entree? If you order a salad, and several healthy side items, and nibble on an appetizer or some bread, you've probably got plenty of calories, and, a pretty healthy meal, too! Don't be afraid to ask your server if they can honor unique requests like "No entree for me....just bring me these 4 side items, please...". Be wary of healthy-sounding names. A Mediterranean diet is one of the healthiest ways to eat. However, just because the word "Mediterranean" is part of the name of a menu item doesn't mean it's low in calories or all that healthy. BJ's Restaurant and Brewhouse offers deep dish pizza made 14 different ways. Their "Mediterranean" style is the 2nd-highest in calories, just behind "Chicken Bacon Ranch" style. Arby's "Market Fresh" sandwiches sound great, but their "Roast Turkey and Cheddar" contains 830 calories. That's the equivalent of one-and-a-half Big Mac's from McDonalds. Don't order dessert more often than once per month. How boring would life be if we couldn't have dessert once in a while? I say, go ahead, but limit your splurge to no more frequently than once per month. Yes, I have cravings when I dine out, too, but I never order dessert more often than that. Think of healthy and lower-calorie options for satisfying your sweet tooth: a small dish of ice cream with either fresh berries or a couple pieces of dark chocolate is all you need. Try that instead of choices like cakes, pie, tiramisu, flan, plate-sized brownies, and other desserts loaded in calories, fat, and sugar. Avoid foods that are fried, blackened, charred, or BBQ'd. As discussed above, frying foods -- even low-calorie, healthy foods -- adds a huge amount of calories. But, frying introduces unhealthy elements, too. Trans fats are one. Having food blackened or charred introduces carcinogenic compounds. Simply searing meat at very high temperatures (eg., frying bacon, cooking a pepperoni pizza, etc.) causes meat to form cancer-promoting compounds called "N-nitrosamines". These compounds are known to be carcinogenic in both animals and humans (De Mey E, et al. 2017). Meat is already an unhealthy choice; these methods of cooking just make it more unhealthy. Steaks: Order the smallest one available...or none at all. • 1992: One of the earliest reports warning of the risks of a diet too high in meat was published in 1992 based on the ongoing Adventist Health Study in Loma Linda, California. This investigation found that men who consumed beef 3 or more times per week had a higher risk of death from coronary heart disease (Fraser GE, et al. 1992). • 2002: In 2002, researchers in Lyon, France reported that red meat and processed meat increased the risk of colorectal cancer (Norat T, et al. 2002). • 2005: Results from the Cancer Prevention Study II also showed that a high intake of red meat and processed meat was associated with an increased risk of colon cancer (Chao A, et al. 2005). • 2007: In their publication Nutrition Action, CSPI stated: "People who eat more red meat -- beef, pork, and lamb -- have a higher risk of colon cancer, stomach cancer, and pancreatic cancer. And perhaps breast cancer if you're premenopausal and prostate cancer if you're African American." • 2017: In 2017, results from the massive NIH-AARP Diet and Health Study revealed that intake of red meat increased deaths due to cancer, heart disease, diabetes, kidney disease, and liver disease (Etemadi A, et al. 2017). Also, see this superb resource from The Plantrician Project: "Quick Start Guide". So, limit steak dinners to only several times per year and order the smallest one on the menu. Research now shows that all forms of animal protein -- ie., not just meat -- increase your odds of developing cancer (Fontana L, et al. 2015) (Levine ME, et al. 2014). Meanwhile, a plant-based diet -- especially vegetables -- are where you get the highest number and amounts of healthy nutrients. If you really want to eat healthy, then base your meals around vegetables. Study The Nutritarian Diet by Joel Fuhrman, MD and strive to eat like that as often as you can. See: www.DrFuhrman.com. 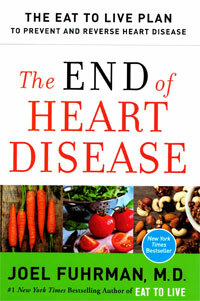 It is summarized in his superb 2016 book "The End of Heart Disease." Adjust your definition of "fine dining" from the huge steak dinner to a plate of vegetables. The once-lowly bean is now considered one of the healthiest foods to consume regularly. Joel Fuhrman, MD, in The End of Heart Disease, points out that beans (legumes) were a consistent dietary element in a variety of cultures associated with longevity: "A 7-8% reduction in death rate was reported for every 2 tablespoons of beans eaten daily." Fuhrman also makes a dramatic distinction between beans and potatoes: While both are plants and both are good sources of carbohydrates and fiber, the similarity ends there. He states that beans are much higher in "resistant" starches, which behave more like fiber. Resistant starches in beans do not contribute to usable calories, and, thus, don't cause a spike in your blood glucose. Further, these resistant starches provide beneficial effects within the GI tract (ie., probiotic effects). In a table comparing the total amount of fiber+resistant starch in beans, lentils, peas, corn, rice, oats, and potatoes, beans contain the most and potatoes contain the least. He also points out that high-glycemic index processed food promotes heart disease even more readily than saturated fats from animal products. And, when carbohydrates are exposed to high dry heat, they can form acrylamides, which are cancer-promoting compounds. So, avoid the French fries...order some beans instead! Alcohol: Avoid hard liquor (distilled spirits). There's no question that alcohol -- in all forms -- exerts toxic effects on a variety of organs. However, at the same time, one or two drinks per day has been shown to be beneficial for cardiovascular health. The smartest choices are red wines and hoppy and/or dark beers. Red wines contain resveratrol while hoppy and/or dark beers contain ferulic acid and xanthohumol. All 3 of these compounds are antioxidants. Hard liquors don't contain these healthy nutrients because they are lost during the distilling process. Note that one of the common behaviors researchers discovered when studying people living in 5 Blue Zones around the world was that most of them consumed red wine regularly. So, avoid distilled liquor. Instead, focus on red wine and dark/hoppy beers. Q: Are the nutritional facts that restaurants provide accurate? ANSWER: Regarding the nutritional information provided by restaurants, a study published in the July 20, 2011 issue of JAMA revealed that 19% of menu items studied contained at least 100 calories (kcal) more than what was reported (Urban LE, et al. 2011.) That's not a lot, but, for people who are trying to limit their calories, it could be significant. Note that an excess of 500 calories per day, every day for 7 days, will lead to a 1-lb weight gain at the end of that week. Bob Greene’s book Guide To Fast Food & Family Restaurants (Simon & Schuster, 2004) is part of his Get With The Program series. This handy pocket-sized book (it measures 3" x 8.5") can be carried with you, or kept in the car. It provides lots of quick-reference information on restaurant chains from Applebee's to Bob Evans to Romano's Macaroni Grille to Wendy's. 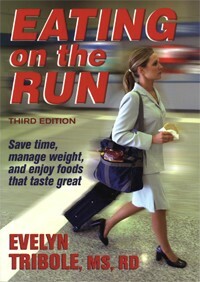 Eating On The Run (Human Kinetics, 2004) by registered dietician Evelyn Tribole, MS, RD, is an excellent book for busy people. Even if you don't read the entire book, the 40-page fast-food data chart is worth the $16.95 price. This book is highly recommended. (see Book Reviews for more information on these books). A good resource for information on glycemic index and glycemic load is the web site www.GlycemicIndex.com maintained by the University of Sydney. Also, don't forget to utilize our Exercise Calorie Converter. 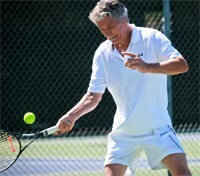 Here, you can look-up over 6000 menu selections and determine how much exercise is required to burn-off those calories. You may think twice about ordering that appetizer or dessert.